Serious photographers generally carry a portable hard-drive for offloading their newest snaps from full memory cards when out in the field. 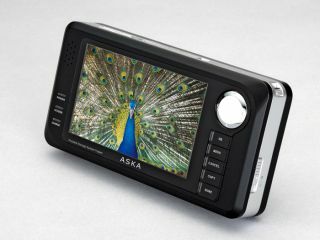 So they'll be pleased to see multimedia added to the latest drive from Aska in Japan. The 370g Tripper V120/160 holds and can display either 120GB or 160GB of JPEG or RAW stills and MPEG4 video clips. Both SDHC-compliant and CF card slots are onboard, as are a USB host port, a mini USB port, video-out and headphone sockets. Should a little reviewing be called for, the 4.3-inch widescreen with 800 x 480 resolution can show those movies and photos. Although the MP3 and AAC playback supported is probably best done through headphones rather than the tiny speaker. Best of all, Aska is offering to trade in old hard drives for a discount. So the V120 (¥69,825, £285) or the V160 (¥79,800, £325) could come down by up to ¥21,000 (£85) if you turn in any 2.5-inch drive larger than 160GB. Assuming you're in Japan, that is.